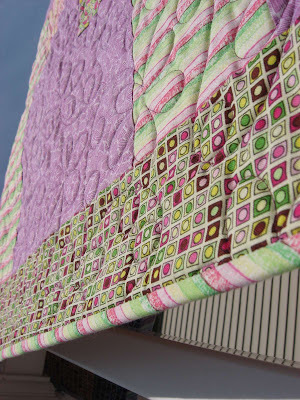 Hooked on Needles: Charity Quilt is finally complete! 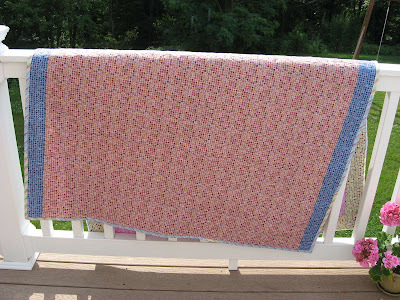 Remember last fall when I showed off that bright and cheerful fabric sent to me by Cori and Myra of Blue Meadow Designs in Canada? 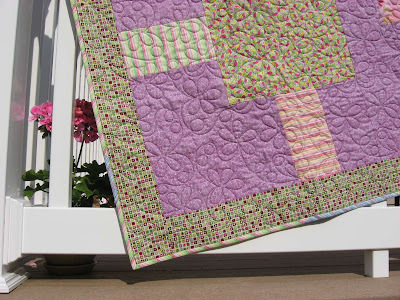 Then remember in early spring I showed the design I made with it in my original Stripes and Blocks quilt? And then just a few weeks ago, remember that I had picked it up from the long arm quilter and I just loved what she had done with it? So I bet you already know what I'm going to say next...and you would be right! 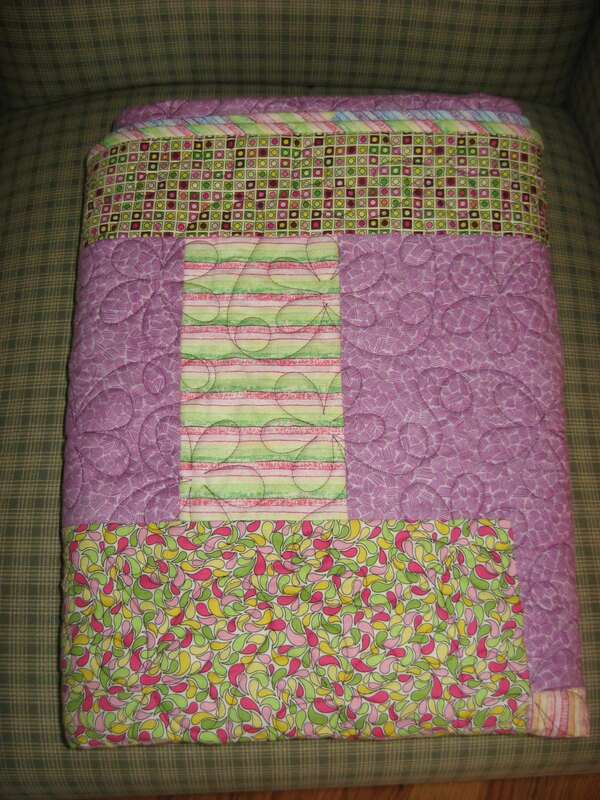 I made the binding and put it on the quilt and now it is complete! What a wonderful sense of accomplishment finishing up a project like this. Now I just can't wait to deliver it...but first I must show it off for just a bit! After all this is my very first original design and my very first professionally quilted quilt, so naturally I am quite proud of it! I love all the happy colors! I made the binding out of the two stripe fabrics because I wasn't quite sure I'd have enough of either one to do the entire binding. So I just combined the two. 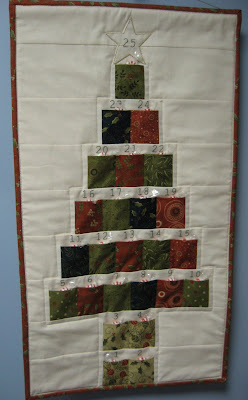 I used Sharon Schamber's method of binding using spray starch and Elmer's glue. You can find the 3 part video series by clicking HERE. I have never been too good at binding a quilt, so I was game to try anything new. This method is just the ticket I needed to perfect binding! And mitering corners the way she shows really does make perfect corners! 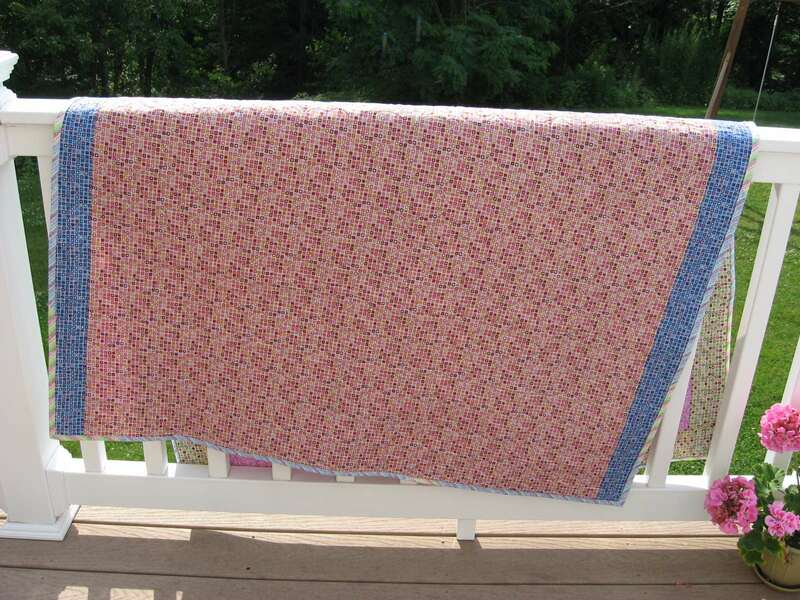 So after showing this to a few people, I'll take it along with the two pillowcases I made with the leftover fabric down to the shelter and deliver it. What a thrill that will be! I'm already thinking of my next charity quilt project, but first I have a few other things to finish up. I've been requested to do a video on a particular crocheted slipper pattern, so I'm working up my sample now. 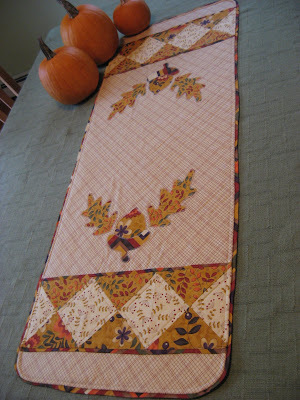 I also received my very first custom order on my Etsy shop, for one of my Petite Point Flowers table runners only without points, so as soon as the visit from my out of town family is over next week, I'll get started on that one. I also have quite a few other things on my must-do list and I am hoping this summer will see many of those items checked off. We'll see! Very pretty. 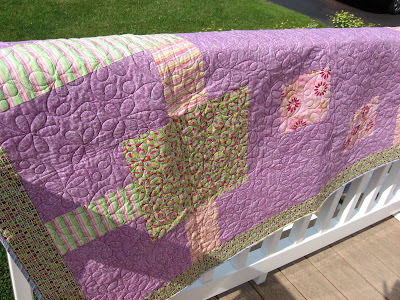 Love the daisy quilting design and that stripey binding. 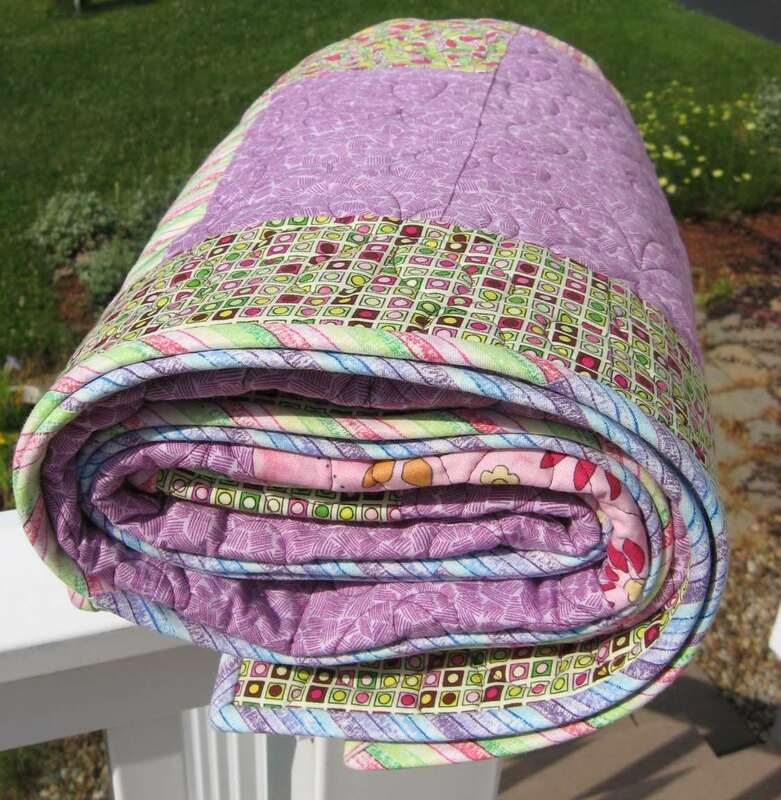 This is quilt is going to put a big smile on someone's face. This turned out great, and I love the pieced binding. Someone is going to be very happy. 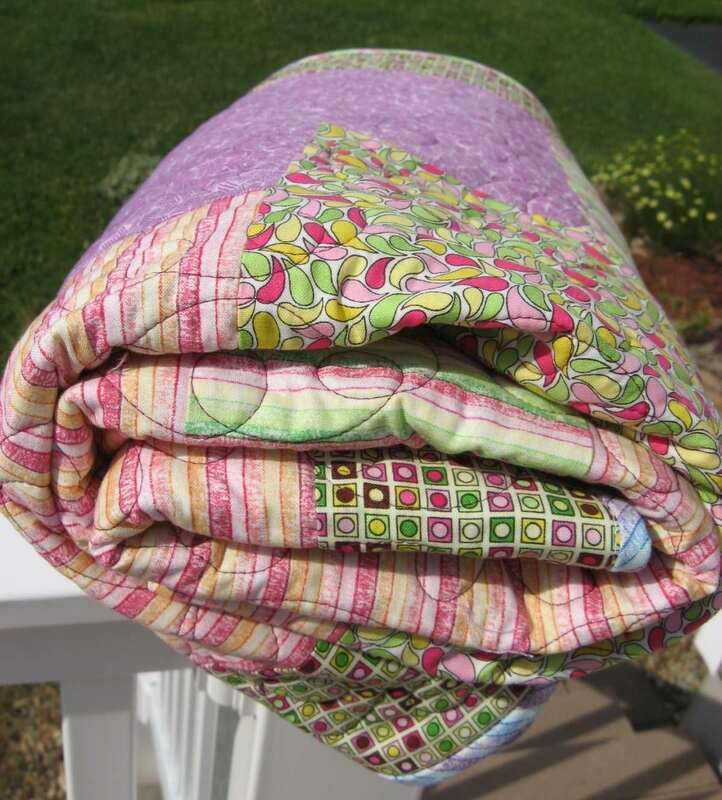 How kind of you to donate such a lovely quilt! 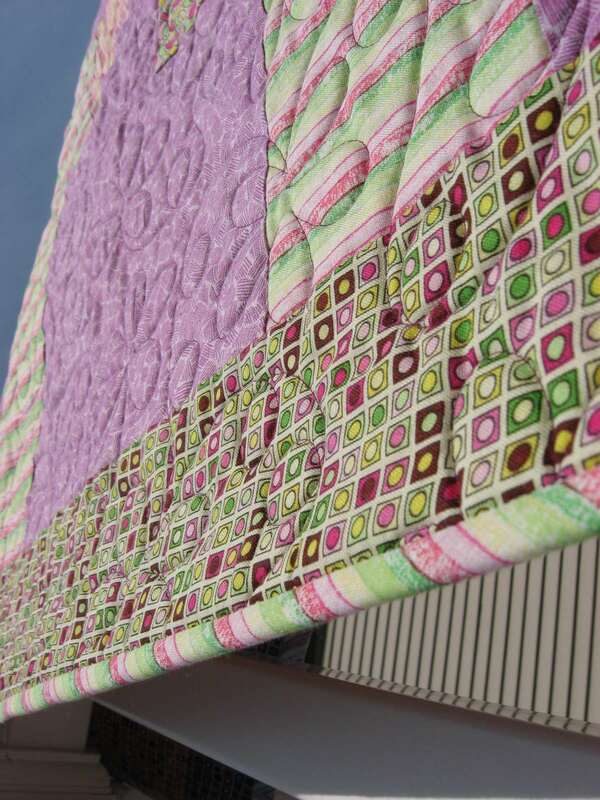 I love the pretty quilting on it! 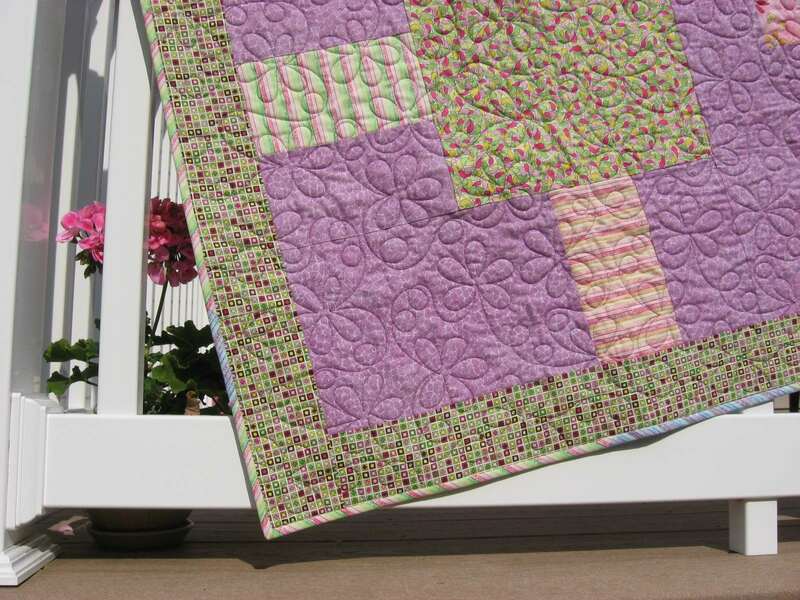 Gorgeous quilt, beautiful job! You are a blessing to someone with your gracious gift. And you have blessed and inspired me with your story.